There has been a statue outside of Villa Park in Aston. It is of William McGregor, who in the late 19th century was a Director of Aston Villa from the late 1870s. He later became the clubs Chairman from the late 1890s. He was also the Founder of the Football League in 1888. The statue can be found near the Trinity Road Stand. 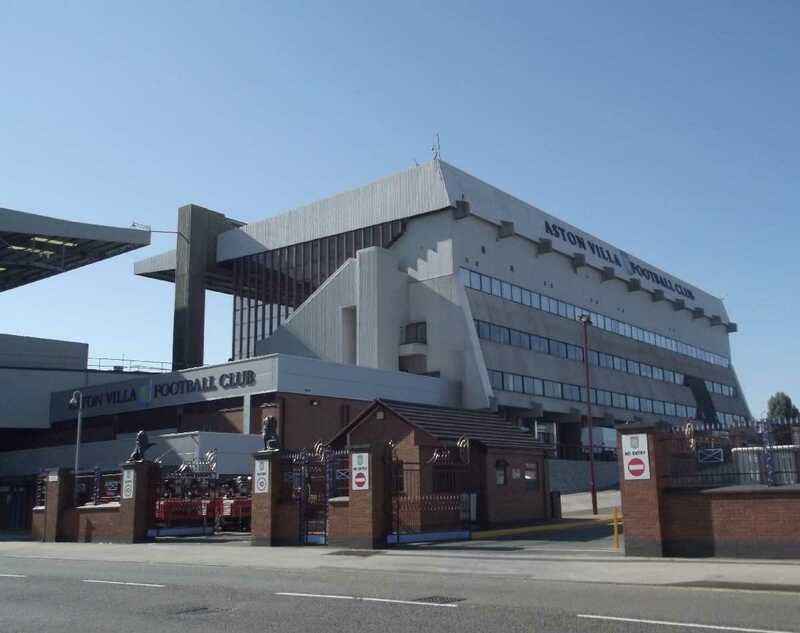 This post will also look at the 4 stands of Villa Park. A statue was unveiled outside of Villa Park, the home ground of Aston Villa F.C. in November 2009. It was of William McGregor, one of the earliest Directors of Aston Villa, and later the Chairman of the club. It was he who proposed the forming of a league in 1888 which became the first professionally organised football league in the world! At the time I took my photos in January 2010, and a few years later in September 2012, Villa were still in the Premier League (before they were relegated to the Championship in 2016). 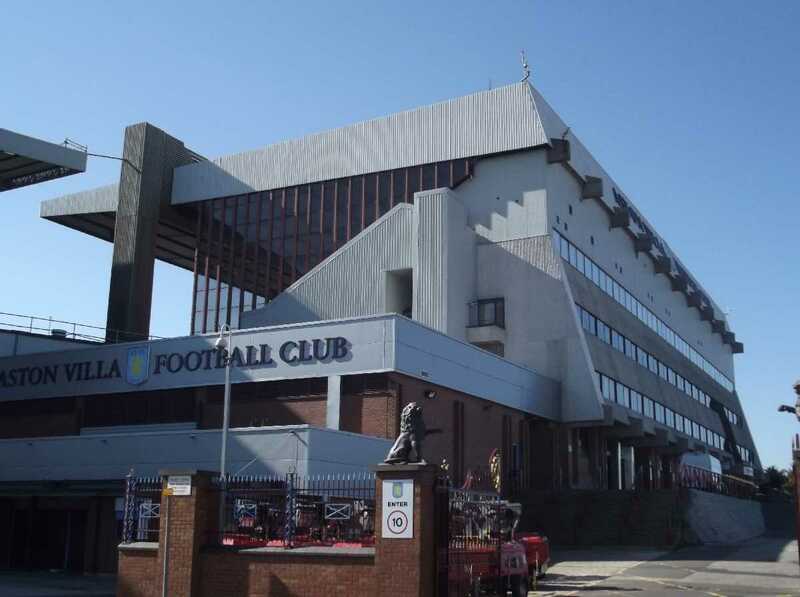 But this post is not about Aston Villa's form in the various leagues they have been in, more about William McGregor and the stadium Villa Park. To find the statue of William McGregor first look for these gates with a pair of bronze lions on either side. The lions were there until at least 2016. Looking on Google Maps Street View the lions were missing in 2017. Anyway look through the gates, or the railings along Trinity Road and you will see the statue near the Trinity Road reception entrance of the Trinity Road stand. William McGregor was born in Braco, Perthshire, Scotland in 1846. He died in Birmingham in 1911 aged only 65. When he moved to Birmingham from Perth, he set up a drapery business in Aston in about 1870. Aston Villa was formed in 1874, and he first became involved with the new club in 1877, at first to become a committee member of the club. He became a member of the club's board of directors, and Villa started winning cups in the 1880s. He became Vice-Chairman of the club in 1895 and finally Chairman by 1897. He was responsible for the club adopting the lion as their symbol, based on the lion of the Royal Standard of Scotland as their crest. In 1888 William McGregor wrote to various other big clubs at the time proposing to form the first Football League in England. 10 clubs were the first members of the league, including West Bromwich Albion. Initially clubs in the south weren't interested in the league, but eventually 12 teams kicked off the first league in September 1888. McGregor proposed the name of "The Association Football Union", but it sounded to much like the Rugby Football Union, so they instead called it The Football League. McGregor became the first Chairman of the Football League and oversaw the creation of a Football League with two divisions. He stepped down, he was elected honorary President until he stepped down by 1894. He was the first ever life member of the League in 1895. The bronze statue was unveiled in November 2009, and it was sculpted by Sam Holland. He took references from life photos and a portrait in the McGregor Suite. The statue is on a red brick plinth. McGregor is holding a cane (walking stick) and a pamphlet. The following information about the stands was taken from Football Grounds Guide. A look at the Trinity Road Stand on the approach past the houses on Trinity Road in Aston. This stand was first built in 1996 in time for Euro '96 (the European Football Championships 1996 which were held in England at the time). The stand was rebuilt to three tiers by 2001 including a row of executive boxes. A close up of the Trinity Road Stand from Trinity Road in Aston. On the side it says ASTON VILLA FOOTBALL CLUB in big letters. In the middle was the club badge with the lion and a star. This side of the stadium is close to Aston Park. There is a nearby path entrance into the park that leads up to Aston Hall. The hall is normally closed on match days, and open on all other days. Next up a look at The Holte End. It was opened in the 1994/95 season and is a two tiered structure. It holds about 13,500 supporters. The building near the car park appears to be much older. It has Aston Villa painted on the side with the clubs badge (it might be tiled). There is steps leading up to the stand from the car park. Not too far away from the stand, at the other end of the car park is The Holte public house, at the corner of Trinity Road and Witton Lane. The Holte End and The Holte pub were named after Sir Thomas Holte, who lived at Aston Hall during the 17th century. The stadium was originally called The Aston Lower Grounds. Was formerly part of Aston Hall's grounds, and a Kitchen Garden used to be on the site of Villa Park. Next we head up Witton Lane in Aston. 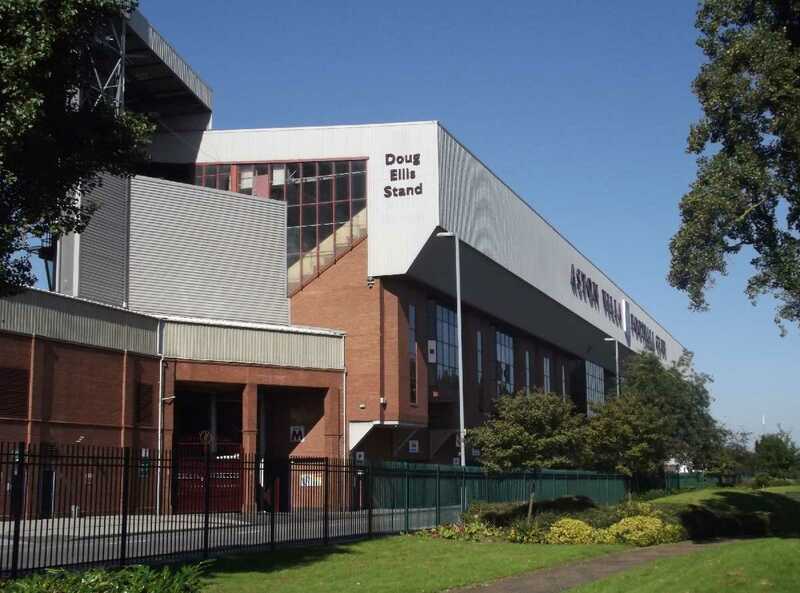 The next stand is the Doug Ellis Stand. It was originally called the Witton Lane Stand. It was rebuilt in 1993 and it replaced an older structure. There was a minor refurbishment for the European Football Championships in 1996 (Euro '96). It was named after the former Chairman Doug Ellis (1924-2018). Seen here from Witton Lane Gardens during September 2012. Sir Doug Ellis used to own Aston Villa and was Chairman in two stints. His first stint as Chairman was from 1968 to 1975. He was a major shareholder and on the board until he was ousted in 1979. He returned as Chairman in 1982 (in his absence Villa had won the Football League title in 1981 and the European Cup in 1982). He sold the club to Randy Lerner in 2006. This stand also has ASTON VILLA FOOTBALL CLUB in big letters. It is visible from the Aston Expressway A38(M) and from the M6 (if travelling in a car or on a coach). The final stand is the oldest stand at Villa Park. The North Stand was built in the 1970s but still looks modern. It is two tiered and about the same height as the other stands. There is a double row of executive boxes running across the middle. This stand is usually used by away fans. It is also close to Witton Lane. It is a short distance walk from here to Witton Station. The club had planning permission to rebuild the North Stand, but it hasn't happened yet. The owners of the club has changed several times in recent years and what with Villa's relegation, it probably wasn't a priority. If it was to be rebuilt it would increase capacity of the stadium to 51,000. A bonus building, The Holte public house at the corner of Trinity Road and Witton Lane in Aston. A Victorian building dating to 1897. It was built as The Holte Hotel. It used to have 10 bedrooms, a 400 capacity music hall, billiard rooms and two bowling greens. It has the same name as The Holte End (see further up this post). See this article from 2007 for more information Aston Villa restores Holte Hotel. Villa fans used the pub up until the 1970s. But it was boarded up and derelict for 28 years until Villa's owner from 2006 to 2016 Randy Lerner and his team agreed to a restoration. The pub reopened in 2007. 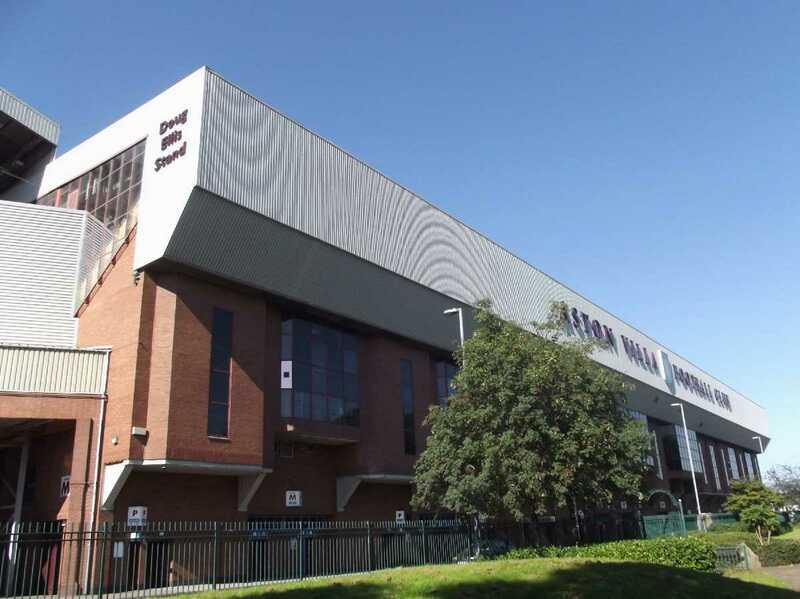 For most fans approaching from Aston Station, or from the M6 motorway, it is the first building they see when they get to Villa Park. It's also visible from the Aston Expressway A38(M) when passing over Witton Lane. Photos taken by Elliott Brown around the outskirts of Villa Park during January 2010 and September 2012.